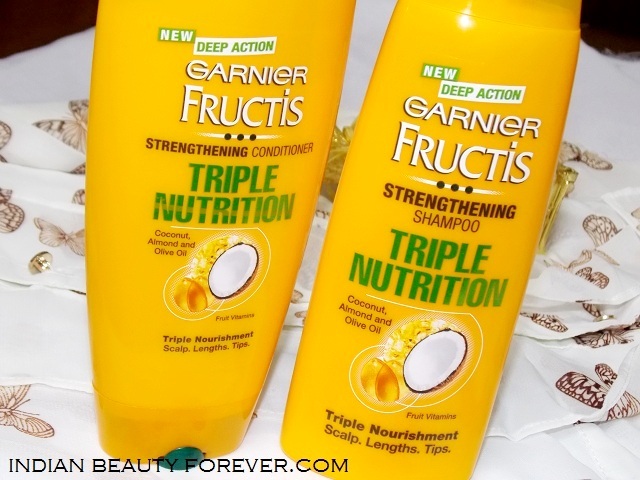 I received these Garnier Triple Nutrition Shampoo & Conditioner couple of days ago but this time before using them, I want to focus on my present hair state so that I could gauge what exactly this Garnier Triple Nutrition Shampoo & Conditioner range has done for me. Sounds good yeah! So as of now, I facing some hair fall, not too much but some strands would fall out or would be in my comb. Other than that my hair ends are a bit dry and rough. This is due to the winter dryness as winter can really takes a toll on the hair like crazy. My hair ends have never been that rough but currently due to the weather and the act that I am not taking good care of them and here I am pointing at oiling and hot oil treatments, which I am not doing. I also have some frizz even if it’s winter. After the wash, when my hair would be air dried, I would notice some frizz which I really want to get rid of or at least minimize. I don’t have split ends at the moment since 2 months ago, I had a shorter layered hair cut which has taken most of the split ends so, I am okay with that but would definitely want the hair ends to be smooth and bouncy. These Garnier Triple Nutrition Shampoo & Conditioner are the newly launched product which claims to provide nourishment to the hair. I liked the yellowish orangish bottle, they look cute sitting in the bathroom rack. I also like the packaging of damage care one which was bright orange. I have always like garnier shampoo and conditioner’s fragrance and these smell good too. The conditioner is sweet smelling. So, this is the present hair condition and my hair woes, thanks for reading. I am looking forward to use this range of Garnier Triple Nutrition Shampoo & Conditioner for a month after which I will keep you girls posted on what exactly these two products have done for my hair.